It’s no surprise that the most counterfeited brand in the world belongs to one of the major designers. It’s perhaps a little more astonishing to learn that it belongs to Louis Vuitton, which has lost some of its cachet as the accessory designer of choice to other, supposedly cooler labels. Yet in a curious way that’s actually helped the position of the label. It’s risen above the whims of fashion. It was always associated with the high end of the fashion market and now it’s consolidated that. It’s the class that’s associated with Louis Vuitton products that makes them desirable and so frequently counterfeited. Louis Vuitton found his company in Paris 1854 making travelling trunks that were lightweight and airtight. They were a sensation and later he brought in the colours of brown and beige to try and discourage cheap imitations. The monogram and symbols were the idea of Vuitton’s son, and introduced in 1896, another measure to discourage counterfeiters. Travel items remained the company’s focus for many decades, only diversifying in the 1960s, when the first heavy wave of counterfeiting happened. By the 1980s the company was heading up a luxury goods conglomerate, LVMH, that included a champagne manufacturer and a cognac company. Vuitton has continued to expand, opening shops in many cities and adding to the line of designer goods it produces, going far beyond the original travel remit. The constant throughout the time of Vuitton in business is that it’s appealed to the luxury end of the market, with prices to match. 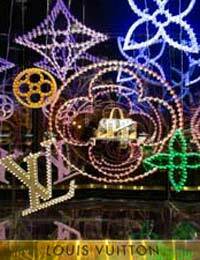 In 2009 Vuitton was recognised as the most counterfeited brand in South Korea, and later, in the world. It’s fair to say, however, that the figures are hazy, and many of the big names, including Burberry, vie for the top space in the chart the designers don’t want. The counterfeiters have tended to concentrate on the Vuitton handbags and purses, for two main reasons. They’re relatively easy to reproduce, at least in overall look, if not in detail. The other important factor is that there’s a big market for these particular items among women who want the look without paying the prohibitive price. It’s ironic that the monogram first used to try and prevent forgeries has now become the relatively easy part of any counterfeit piece, and really all that those buying the knock-off item desire. Louis Vuitton has been very active in fighting counterfeiters and trying to keep the integrity of its brand. As part of the LVMH conglomerate it’s won several court battles in France against eBay, one in 2008 bringing a $63 million fine against the online auction site. By being so pro-active they try to keep counterfeits off the market. Ultimately it’s a battle they can’t realistically win completely, but by blacking as many of the outlets as possible they can try to minimise the damage. It’s a strategy that’s been adopted by others, with differing degrees of success.